Your stats page includes a bunch of nifty graphs, charts, and lists that show you how many visits your site gets, what posts and pages are the most popular ones, and much more. You can access your stats by selecting My Sites → Stats. When you visit your Stats page, you’ll see a chart which represents your traffic for the day, week, month, or year (depending on which filter you’ve selected at the top of the page). The two main units of traffic measurement are views and unique visitors. A view is counted when a visitor loads or reloads a page. A visitor is counted when we see a user or browser for the first time in a given period (day, week, month). The weekly unique visitors figure can sometimes be less than the sum of daily visitors for the same week. This occurs when the same visitor appears multiple times during the week. The same goes for unique weekly visitors being less than your monthly visitors number. Yearly totals are simply a sum of your monthly totals. You may also notice that your visitor count lags behind your views count. This is due to the way we process the numbers. It can take up to two hours for new visitors to show up in your stats. This chart also includes tabs for viewing stats for likes and comments on your site in a given period. Views by logged-in members of your site, including yourself, are only counted in your stats for sites that are set to private. You can see how many views you’ve received per country by day, week, month, and year. If WordPress.com is not able to determine your visitors’ location, their views will not be counted in this chart. The referrers section lists other blogs, web sites, and search engines that link to your site. A view is associated with a referrer if a visitor lands on a URL on your site after clicking a link on the referrer’s site. Sometimes the list of referrers may include sites you’d rather not see. If you wish, you can report those referrers as spam and they will no longer appear in your list of referrers. To mark them as spam, navigate to the Referrers section of your stats. Each entry (with the exception of a few whitelisted referrers, such as WordPress.com) has a clickable ellipsis next to the view count. When you click the ellipsis, a red Spam flag will appear. If you click the flag, the referrer link will go into your personal spam referrer block list and won’t show up in the future. If you change your mind right away, you can click the Not Spam link that appears where the Spam link was previously. However, once you have navigated away from the stats page, you will not be able to undo the action. Marking a site or referrer as spam will not affect your stats. It will only keep that referrer from appearing on your stats page. This section of stats will list the Posts and Pages that have received the most views in the time period you’ve specified at the top of the page. A view is only counted for a post or page when the permalink URL is visited, or the full post is viewed in the Reader. If a visitor reads a post while viewing the home page of your site, the view will not be counted towards the post, only towards total views. These are the terms, words, and phrases people use on search engines (like Google, Yahoo, or Bing) to find posts and pages on your WordPress.com blog. These do not include the terms which your readers use within your site’s Search Widget or any other search form on your site. When we don’t know the search terms, we show them as Unknown search terms. Some search engines don’t reveal search terms for privacy reasons. Google, for example, has been encrypting the vast majority of search terms since 2013. Links you add to your post and page content. Links placed in comments by your readers. Links that appear in your blogroll. Links attached to the names of users who comment on your site. Links to images in a gallery. If your site features content by multiple users, this stat will let you see how much traffic each of them has generated. Clicking on a name will reveal the most popular posts and pages published by each author, and the number of views each has attracted. Posting activity: a visualization of your posting trends, showing how many posts you published and when. Most popular day and hour: what time of day and day of the week your site gets the most views. All-time posts, views, and visitors: your site’s total posts, views, and visitors, along with your all-time best day for views. Today’s stats: How many views, visitors, likes, and comments your site received today. Latest post summary: How many views, likes, and comments your most recent post received. Tags & Categories: The number of views your most popular tags and categories have received in the previous seven days. Your Insights page also includes recent stats about comments on your site, popular tags and categories, and your site’s followers. Your site must be enrolled in WordAds for this option to appear. Your site must be public for WordAds and the Ads stat section to be enabled. Stats for ads are fetched once a day from the ad server. They are not shown in real time. Ad stats are an estimate and are subject to change. They are finalized the month following the one in which they were earned. You can click the title of each module on your stats page, and scroll to the bottom of that module to download your stats. Simply click on the Download data as CSV link and download the file to your computer. To complement our built-in stats and to give you even more information about your traffic, you can use Google Analytics as part of the WordPress.com Business plan. Do Site Stats include my own visits to my site? Only for private sites. For users with private sites, your Site Stats page will show any visits that you have made to your own site, as well the visits of other users who have access to your site. How do I find out who my followers are? On your Insights page you will see a list of your most recent followers in the Followers module. You can use the dropdown menu in that section to switch between your WordPress.com Followers and your Email Followers, and click on “View All” to view a full list of your followers. The Publicize module also shows a list of how many social media followers receive your posts through the Publicize feature. Why don’t post and page views add up to total views? Post and page views are included in your site’s total views, but there are many views that aren’t tied to a post or page URL. The front pages, category, tag, date, and author archive pages, and search result pages are all examples of other views that only count towards total views. Why doesn’t the number of referrers add up to the number of total views? Not all visitors will land on your site by clicking a link somewhere else. Visitors may type your URL directly into the web browser, click a link in an email, or click a link in another application which then loads the browser. Why is the number of views less than the number of likes? Readers may like your post without visiting your site, for example on the Reader. Since they didn’t actually visit your site, liking a post in this way does not count as a visit. How can I view my RSS stats? Followers reading your site via its RSS feed will not count toward your site statistics. You can, however, see the number of syndicated views each post receives on your stats pages when you access your stats via the WP Admin dashboard. Can I get stats for my self-hosted WordPress.org site? Yes, install the official (and free) Jetpack plugin by WordPress.com. Can I display a hit/view counter on my site? Yes, use the Blog Stats Widget. How can I view stats for days more than a month ago? If navigating through the summary view, stats are only offered for the past month. This date can be edited to jump to any date in Year-Month-Day format. What users can see my site’s stats? All of your site’s users can see the stats: Administrators, Editors, Authors, and Contributors. 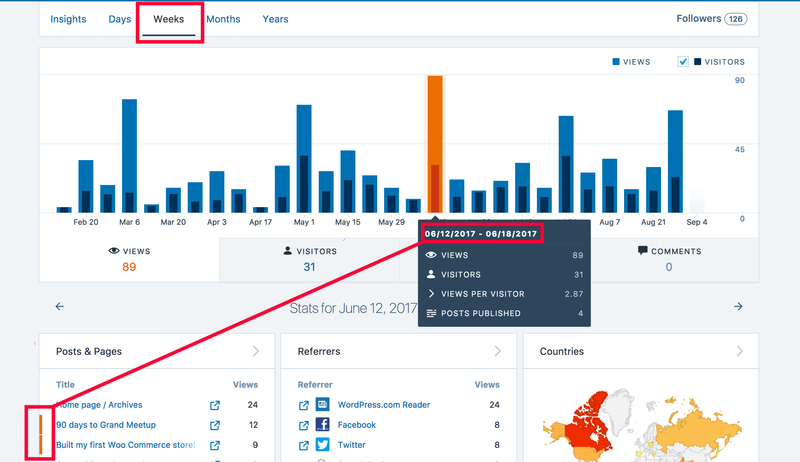 What data does Stats collect about my site’s visitors? As part of collating the above information, Stats uses data like IP address, WordPress.com user ID (if logged in), WordPress.com username (if logged in), user agent, visiting URL, referring URL, timestamp of event, browser language, and country code. However, none of this information is available to site owners. For example, a site owner can see that a specific post has 285 views, but he/she cannot see which specific users/accounts viewed that post. Furthermore, the Stats logs, in which this information is stored, are only retained for 28 days. What is the orange bar before some posts and pages in the stats screen? The orange bar indicates the posts and pages published within the selected date range.